Over the weekend I had a flash of clarity while listening to a podcast from Jeremiah Owyang about companies trying to gain a significant a foothold in "Social Marketing". There was one particular moment that crystallized things for me. "Most companies treat social media like interactive marketing which is computer to consumer, social media is people to people"
This is really the core issue and what currently represents a divide between the worlds of interactive marketing, and organizations who choose to participate in social media beyond pushing content. 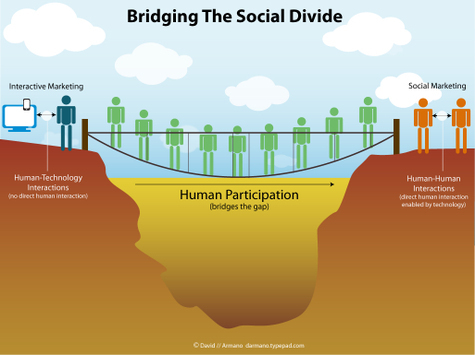 The gap itself is bridged by participation, meaning that a company empowers PEOPLE to engage and interact with other PEOPLE. This means public and private conversations, activity in comments and a commitment to be responsive in real time. This is potentially messy business and requires a long term commitment. Interactive or digital marketing techniques traditionally do not include this dimension and as outlined in Owyang's podcast the end result often times comes across as traditional marketing using a social channel or worse, can result in a community backlash. "Logic+Emotion exists at the intersection of business + experience design—where passive consumers become active participants." I wonder if it's time to swap "passive consumers" for "passive companies". Maybe it's time for all of us to become active participants?